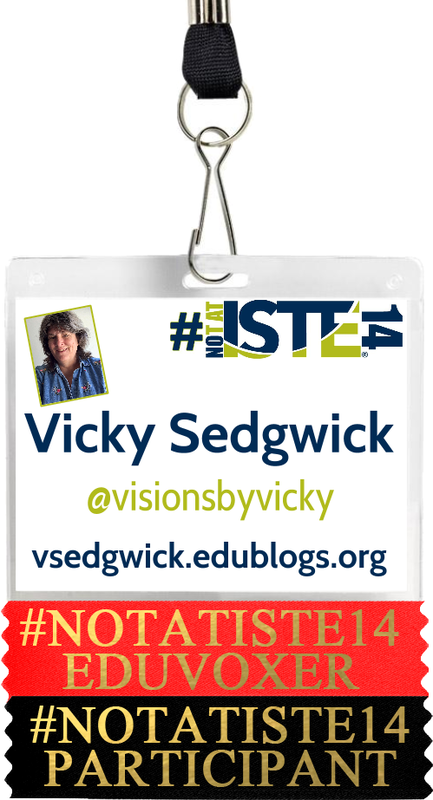 Whew, what a whirlwind trying to follow along with all of the #iste2014 and #notatiste14 activity on Twitter in the last two days. The activity in the #notatiste14 Google+ Community has really picked up, with 241 members currently and growing all the time. It’s very fun to read the introduction slides for everyone. Some of these are so creative. There’s been a couple Google On Air Hangouts and we even have our very own #notatiste14 Photowalk. If you too are Not at ISTE 2014 and want to join the fun, just send a request. In addition to just following along on Twitter and reading the posts in the G+ Community, here’s what I’ve been doing the last two days while #notatiste14. Friday at ISTE is a pre-conference day which means there’s not quite as much activity on Twitter. Just because the conference hasn’t officially begun, doesn’t mean there’s no activity – there is still a lot going on as people arrive and get their conference materials including their badges (more about that later), meet with new and old friends, and participate in things like Hack Education. Hack Education: This unconference is an event I was sorry to miss. It is always an amazing day though the sessions are typically quite large so it can be hard to hear what’s going on. You can see the Session Board for the day on the ISTE Unplugged Wiki. So many of the sessions sounded great as I followed along on the Twitter Stream. In addition to the tweets, some of the sessions added a page to the wiki or took collaborative notes and those are linked from the session board! Go over and see what you missed. I didn’t know what I would start. Badge creation was on! It’s been so much fun seeing all the variations on the badge and I really love that one member of the community said they wished they could create their own badge for every conference. How fun would that be? Then, Jen Wagner mentioned ribbons. Ribbons … ah, yes, we need ribbons! After too much time spent in Photoshop, here’s my current badge with ribbons! I have ribbons for the Photowalk and other things to add, too, as I continue to participate in #notatiste14 events. Oh, that EduVoxer ribbon, that’s because we have a Voxer chat for #notatiste14, too. Thanks to Barb Gilman for getting that started. It’s great to not only interact with others through pictures or posts or tweets but with Voxer we have VOICE, too! Challenges: #notatiste14 has challenges for participants, too! I am not being very competitive with these but thought that getting a few selfies with people I know at ISTE 2014 shouldn’t be too difficult since so many of them take and post photos all the time. This has been tougher than I thought but I did get one friend do do this. Thanks, Diane! Interestingly enough, I probably wouldn’t be doing a lot of selfies with others if I were there but for some reason the idea of this challenge appeals to me. Now, to get a few more of these. Doubt I’ll get the keynote one but someone I know will be on that Ferris Wheel, I’m sure. C’mon, take a photo for me! I have been taking a selfie (okay usually more than one) daily for ISTE and am changing my profile pictures on G+ and Twitter to that day’s selfie. That way if someone uses those for the photo, they have a picture of me from the same day – it’s almost like being there! Okay, not really, but at least it’s a current picture. I’m also collecting all of the selfies on Dropbox in case someone wants a choice of photos. For me conferences are about connections and the #notatiste14 community has been great about making connections this year even though we span many time zones. It’s not face-to-face, but with all the different kinds of sharing and the addition of voice, it’s definitely a great way to build a community. It’s also awesome that people are being exposed to new apps and new ways of using tools they may already have been using. I saw a lot of “it’s the first time I used Google Drawing” and “I’ve never used Voxer before”, etc. It may be fun but there’s definitely a lot of learning going on, too. Learning: Speaking of learning, if I had been at ISTE 2014, I know I would have checked out a lot of the sessions on Coding and other Computer Science related topics. I have started a collaborative document on the Coding / Computer Science sessions being offered this year. I would love to try to collect a lot of what is being shared on the topic of teaching kids to code especially for students in Kindergarten through 8th Grade. So far, I’ve been doing this by going through the ISTE Program and putting the session information into the document. I then try to find contact information for the presenters, if I can and add that, too. For the two poster sessions that were on Saturday, I went through the Twitter feed to see if I could find anything shared about them. I did find a few photos but would love more. It would be so awesome if in poster sessions, someone would take video as well as photos and, of course, share those out via Twitter. Better yet, it would be great if some ISTE 2014 attendees became collaborators on the document and added to it as they attended sessions. 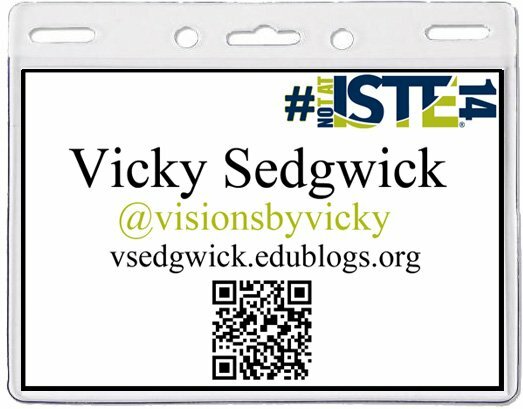 If you’re at ISTE 2014 and would like to be a collaborator, please email me at visionsbyvicky@gmail.com and I’ll be glad to add you as an editor. As I was going through the Twitter stream during the poster sessions, I saw something tweeted about a community of educators who are interested in teaching kids to code, edWeb.net: Coding. So far, there aren’t many members nor much activity but I would love a community like this to exist so I’m hoping this may grow and thrive. If you’re interested in teaching kids to code and integrating coding into classroom lessons, please join. Let’s build a community. I also learned about a new possible backchannel option called 81Dash. I was introduced to this app during the ISTE 2014 Keynote and like the look of it. I can see it being used more with adults (or older students) since you do need to have an account which requires an email address. I like that you can share photos and files (and not sure what else) and that you have more than 140 characters for a message. I’ll need to do some more exploring on this one. Plans for Sunday: I missed out on the TeacherCast broadcasts on Saturday. Since, I had heard they would rebroadcast, I didn’t bother getting up at 6am but so far, they haven’t been shared online after they were broadcast live. I believe they will be at some point but I know that there are technical problems with uploading. So, for the rest of ISTE 2014, I intend to get up early to watch these live. I also plan to follow along on Twitter and try to fill in more information on my Coding Sessions document and get the rest of the Monday and Tuesday sessions added to the document. Maybe during a session tomorrow, I can join a backchannel and earn more points in the challenges! I want to take a PhotoWalk at some point tomorrow. It’s been awhile since I’ve taken photos just for me. Oh, I’ll need to take a new selfie, too and then bug those I know at ISTE 2014 to take a virtual selfie with me. Maybe I’ll see how far I can get on the Bingo Challenge, too. I’m sure there will be lots of learning and fun. So, if you’re #notatiste14, what are your ISTE 2014 plans for tomorrow? 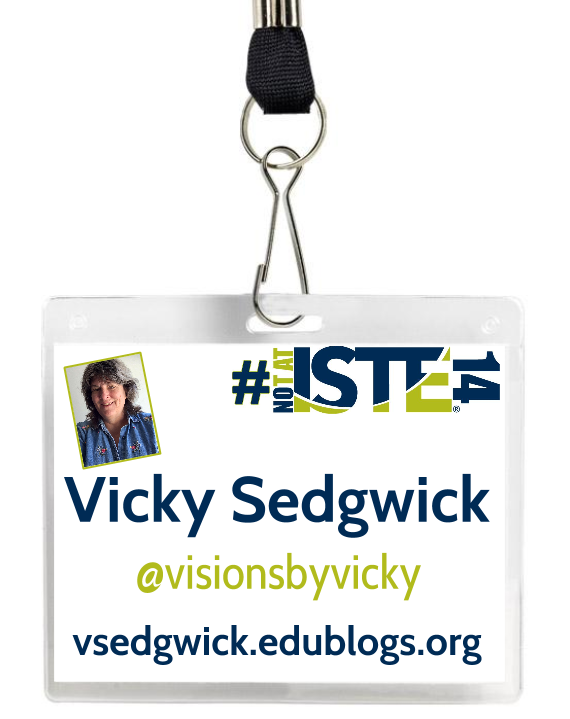 If you are at ISTE 2014, want to take a virtual selfie with me? 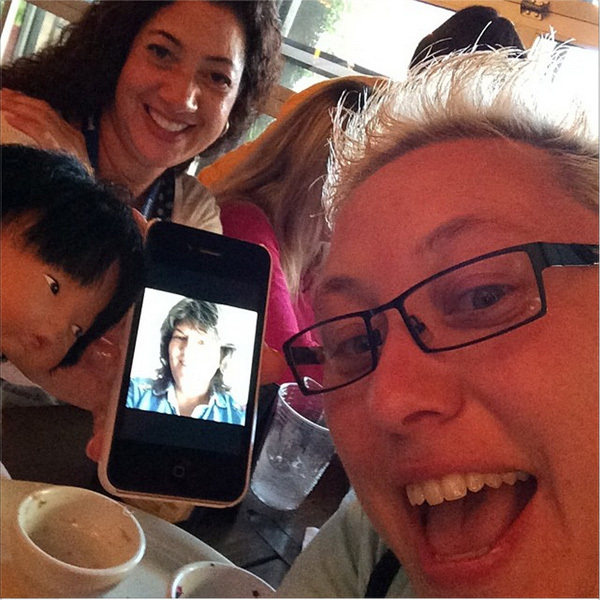 Thanks for sharing your experience of virtually attending #ISTE2014! The #NOTAtISTE14 community has been amazing and personally I feel I’ve learnt more participating as #NOTAtISTE14 than I ever achieved attending ISTE. Loved the social networking, f2f aspect of attending ISTE but with #NOTAtISTE14 we have a vibrant community that is networking with each other while being able to concentrate on our learning! Thanks Sue. I definitely agree that #notatiste14 is a vibrant community of great educators. Thanks for the great post and all of the information shared. I too am learning a lot from the #notatiste14 community both through Google+ and through Twitter. Still working on learning about voxer. Glad you enjoyed the post. Just remember to turn off Voxer notifications (or at least the sound) and treat it like other social media. You don’t have to “listen” to every post. Congrats! Your post got featured in the Edublogs Reader! Check your dashboard! You should also add your post to our subreddit at http://reddit.com/r/Edublogs to attract more readers!